I’m going to be using a few technical terms in these pages on staircases so let’s take a quick tour of stair parts so that you know what I’m talking about. Then we'll discuss how the different components of a staircase contribute to staircase safety. Treads – the treads are what you tread on so pretty self explanatory. 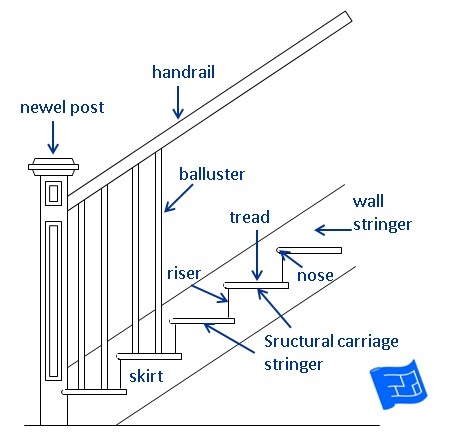 Stringer – the parts of the staircase which the treads and risers and risers. This is an essential stair part unless the staircase is a cantilevered staircase. Wall stringer - the panel that is placed above the staircase against a wall. A non-essential stair part. Nosing – the shape of the front part of the tread. The is a non-essential stair part. Skirt - the decoration that is used just below the open side of a staircase. This is a non-essential stair part. Newel post – the posts at the top, bottom and turning places on the stairs that are an important part in the structural integrity of the balustrade and handrail. Balustrade / spindles – the smaller vertical parts of the handrail. Bannister / Handrail – the handrail on top of the balustrade or attached to the wall. Goose neck – this is a visual analogy for the part of the handrail immediately after a newel post on the descent that is shaped like a goose neck. Plan ahead – don’t get caught out in the heat of the moment. When it’s time, install a stair lift for the elderly and stair gates for the very young. Keep your legs together! Even if sliding down those handrails is tempting, abstinence is the best policy. So that’s my public service announcement over and done with. If you’ve lived in a home with stairs, the chances are that you’ve at least tripped and possibly taken a tumble down the stairs at some stage. The stairs account for many accidents in the home, particularly for the old and the very young. So what elements of design are important to keep the stairs as safe as possible? 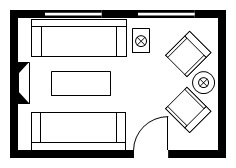 The dimensions of the stairs, particularly the treads and risers. are an important part of the safety features. A securely fixed handrail is essential to staircase safety. Even if you’re not holding it when you fall, your reflex will be to reach for it as soon as you sense you’ve tripped and it could well save you from a bad fall. The placement of the handrail is also important, not only for holding onto it, but also as a visual cue. When we spot a handrail, our minds automatically think about stairs. If the handrail doesn’t appear slightly beyond the top step, we may miss the fact that there is a step beneath our feet. Similarly if the handrail doesn’t end fairly promptly at the bottom of the stairs me may expect another step when there isn’t one. I have noticed a trend for handrails that are indented into the wall. I must admit they do look sleek, and yet they’re harder to grab hold of if you’re falling. It’s a trade-off. The surface material of the stairs contributes in two ways: how likely you are to slip on it and how hard it is to land on. Adequate lighting goes without saying. At night time it can be safer to have lighting just bright enough to make the stairs visible without it being too bright for our eyes in the middle of the night. It may seem counter-intuitive, but a short run of steps (eg one or two steps) can cause accidents because it’s hard to see. Generally, it’s best to have no less than three steps. This means that there will be a sufficient change in height for anyone to notice and subconsciously realise that there must be steps somewhere. A change of floor material and addition of a hand rail for short runs of steps also help to prevent accidents.